A report from Player’s Health detailing injuries and risk management solutions has been released, showing the collective Player Health & Safety impact at the 2018 ENPL National Finals (July 13-14) and 2018 Girls NPL Finals (July 12-16) at Aurora Sports Park. AURORA, Colo. (Aug. 20, 2018) - A report from Player’s Health detailing injuries and risk management solutions has been released, showing the collective Player Health & Safety impact at the 2018 ENPL National Finals (July 13-14) and 2018 Girls NPL Finals (July 12-16) at Aurora Sports Park. As a Players First partner advancing the pillar of Player Health & Safety, Player’s Health deployed certified athletic trainers and supporting personnel with Player’s Health technology to track and manage injuries that occurred during both tournaments. Typically, injury data is rarely collected in youth sports. This detailed study counters that lack of reporting with valuable data regarding types of injuries, player positions, time-of-day influence and more. A total of 104 teams – 88 of those competing at the larger 2018 Girls NPL Finals – competed over the five-day period, resulting in 126 incident reports. Eighty-seven of those athletes received medical care and were cleared to return to play, while the rest were held out for the remainder of the tournaments. Player’s Health estimates a cost savings of $12,177 for parents and teams if Player’s Health medical staff were not on-site. These costs were calculated based on billing CPT Codes and medical services charges in Colorado. In addition, 950 bags of ice were used, 39 ankles wrapped and 36 percent of treatment was preventative. Other key findings are detailed below. The most players were playing on these days, due to the ENPL National Finals also taking place alongside the Girls NPL Finals. Player’s Health will soon release another report detailing these types of findings for the National Cup XVII Finals, which Player’s Health also serviced, July 20-24 in Aurora, Colo.
Player’s Health mobile technology promotes real-time communication between coaches and parents to best care for the health and well-being of these players, with HIPAA-compliant interface that simplifies the flow of athlete health information between parents, coaches and health care providers. In May, Player’s Health introduced its Safety Needs Assessment online tool, a series of questions to help determine if your sports organization is effectively utilizing proper safety practices in sports, and potential barriers to these practices. Burks then provided a walkthrough of the needs assessment in a US Club Soccer live webinar. US Club Soccer encourages its members to use this resource as an integral part of risk management policies and Player Health & Safety standards. 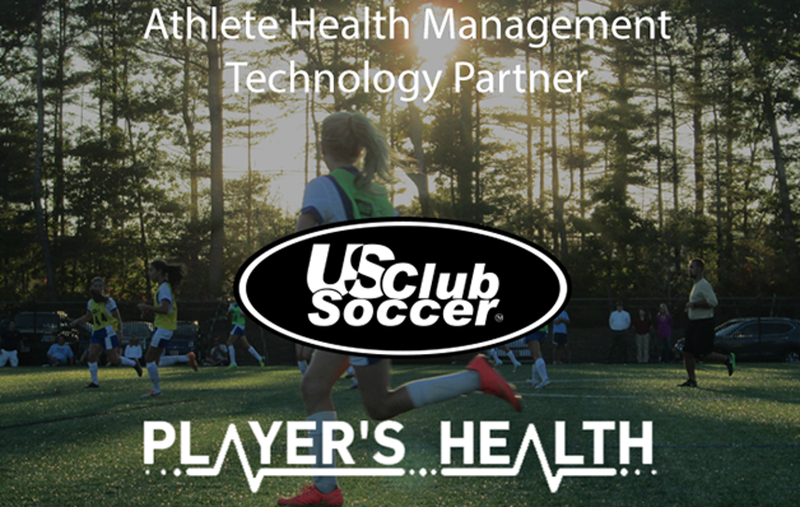 Player's Health is now free to use for all US Club Soccer members. Now, any US Club Soccer organization can access the risk management tools they need to easily stay on top of concussion protocol and injury tracking. We encourage clubs to use this resource to improve the health and safety of their athletes, and to take their risk management practices to the next level.